As I said in a prior post, it’s a Sony PRS-T1. “PRS” stands for Personal Reading System, but I don’t know what the “T1” means. I reckon they should have put a friendly name on top of it. They own (or owned) the name “Bookman” so that is an obvious choice. But no. Instead we get a model number. The e-ink display is fabulous in most respects. It looks just like paper (which is the idea) and looks best in full sunlight. The only niggle I have is the way it refreshes, which includes a full reversal of the image. There is a technical reason for this, which I don’t understand quite enough to explain, but it slows the page refresh down considerably. I’m hoping that the next generation of e-ink, whenever it appears, will greatly improve this. But the current screens are extremely readable. The touch interface is less wonderful. There is a significant lag before a touch is registered and responded to. And swiping to turn a page is cute up until it mysteriously decides you haven’t lifted your finger off and starts paging forward like crazy. This is a known bug but it’s unknown whether it’s a software or a hardware issue. For both of these reasons, I have been using the hard page change buttons. I have read two whole books on it now, plus a magazine. The books were G’day LA by Tony McFadden and Write the Fight Right by Alan Baxter and the magazine was Aurealis #45. It was possible to get lost in the books whilst reading them and that’s a win for the overall ebook reading experience. I had tried reading all of them on my PC and it just wasn’t possible to get into them like that. So that’s a win for the e-reader. 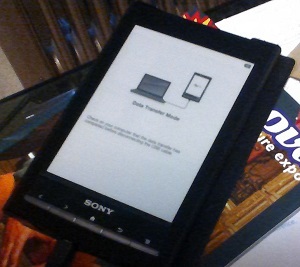 Putting ebooks on it is very easy, too. It presents as mass-storage over USB so copying the file over is easy. And it rescans when you unplug it so it finds new stuff anywhere. But the very latest Calibre has a plug-in to recognise it and update the reader’s internal database, which makes things a lot quicker. I haven’t delved into the Collections mechanism yet, but I suspect that that is just a matter of time. Despite that, I’m glad I bought it. My next step is find a proper cover for it. I’m currently using the packing pouch it came in, but that’s not designed for that and is fast wearing out. This will help be able to hold it more easily. Overall, it’s a good purchase!